You can download the General Terms and Conditions by clicking here. All possible orders made on the website http://www.archiman.fr are strictly reserved for private individuals. These General Terms and Conditions (hereinafter named “GTC”) have been established between the company KASTE & CO SAS, on one hand, with a share capital of 11,200.00 €, registered to the Registry of Commerce and Companies of Nice, under the number 830 400 479, with its headquarters located at 90 AV DE LA LANTERNE Bât. LES LENTISQUES, 06200 NICE, and owner of the brand ARCHIMAN, hereinafter named “ARCHIMAN”, and any individual, on the other hand, having placed an order on the website http://archiman.fr, hereinafter named “the Client”. All purchases made on the website http://www.archiman.fr, require the positive acceptance from the Client of all the General Terms and Conditions that the Client has acknowledge prior to placing their order. The Client that purchases on the website www.archiman.fr declares being legally capable of committing to the present General Terms and Conditions. - if you wish to create an account, you can proceed to registration via the website by using the button “SIGN IN”. Lastly, validate your payment method. On the page that summarizes and lists your selected product(s), the button “CONFIRM MY ORDER” will allow you to validate your shopping cart and your selection of product(s). Proceeding to online payment for your order according to the payment method chosen through clicking on the button “PROCEED TO PAYMENT”. Once the payment has been validated, you can print your order if you so wish. In return, we will send you an e-mail confirmation for your order, on which will appear an order number and, for reminder, the amount to be paid. This document will include a link that will allow you to download the present GTC and a cancellation form allowing you to exercise this right if the need should present itself. ARCHIMAN, commits to honoring all order received, as long as available stock permits. The price of our products are indicated on our online catalogue in Euros and include all taxes (excluding shipping costs). They include French VAT fees. If the VAT rate has recently been modified, whether it has increased or decreased, this change will be reflected in the price of all products.. Outside the European Union, custom or importation taxes could be added to the price of our products and are to be paid by the Client. It is the Client’s responsibility to seek more information concerning the amount of tax to be paid from their local customs authority. Prices expressed in other currencies are for referential purposes and notably depend on the applicable exchange rate during order payment. Our prices can be modified at any given point in time without prior notice, yet all products ordered will be invoiced at the price shown during the validation of your order. Once the GTC have been accepted and the order validated, the Client will pay on the website www.archiman.fr. Payment is always performed per order and before the shipment of merchandise. No discounts for early payments are given. All orders placed, regardless of their physical location, are paid in either Euros, USD or GBP and the price will be shown to the Client according to their selected geographical zone. Postage stamp nor cash payment is accepted. Warning, in the event where the amount paid and the order amount are not equal, the order will be suspended for 15 days, until payment is made in full amount and if the product ordered is still available. If payment is not completed in 15 days, the order will be canceled. You can directly pay for your order on our online boutique with a credit card (MasterCard, Visa or American Express). During the final stage of your order validation process, you will enter your credit card number as well as the validity date and the security code on the back of the card (3 numbers situated next to the signature) [you will never be asked for your PIN code]. This information is entered into an encrypted portion of the website and all transmitted information is coded. Banking information does not circulate on the Internet and is only sent through encryption, in other words, they are coded in such a way that makes them completely illegible. They are conserved by ARCHIMAN via its subcontracting service, the managing payment company STRIPE, only for the duration necessary for payment completion. You can pay for your order directly on our online boutique via PayPal. During the final stage of your order validation process, you can click on the PayPal logo that will automatically redirect you to their website. In order to protect against abusive activity from fraudulent parties, ARCHIMAN monitors orders that have been validated on its website. Within the context of these monitoring procedures, our Client Services may be required to request extra documentation for the validation of your order and notably to confirm your identity or to confirm your address, name or the name of the person indicated with the delivery address etc. In this case, the processing of your order will be executed upon receipt of these documents. We reserve the right to cancel any order if these additional documents are not received within 10 days or in the event where documents are considered non-compliant. ARCHIMAN reserves the right to cancel any order from a Client that has experienced a previous payment dispute or for any other reason relating to abnormal order activity, at the discretion of ARCHIMAN. The delivery address that is recorded is identical to the one furnished by the Client during the order completion. Please note that it is advantageous to group all of your purchases into one single order. Warning, if you place two (or several) orders on the same day containing the same delivery address, we cannot consolidate these orders and the shipping costs will be invoiced for each individual order. The Client has the choice between two shipping methods: Chronopost and Chronopost Point of Distribution. All shipping costs and time periods in Continental France are found on the page Shipment & Returns. Deliveries outside of Continental France will be made by Chronopost. The delivery fees and time periods vary depending on the destination. Delivery fees are of the responsibility of the Client and vary according the final destination: all shipping costs and time periods by geographical zone are found on the page Shipment & Returns. For all orders placed before 12:00 PM, they will be shipped on the same day, except for orders made on Saturday and Sunday that will be shipped on the following Monday, as well as all orders that are made on public holidays that will be shipped on the following business day. The average delivery time, after the order has been shipped by Chronopost is between 5 to 7 business days. The average delivery time, after the order has been shipped by Chronopost is between 2 to 5 business days. These delivery time periods are given for referential purposes and only if the given products are available. In the event of a foreseeable delivery delay, ARCHIMAN commits to informing the Client as soon as possible and by all means of communication so the latter can choose to maintain or cancel a portion or the totality of their order. ARCHIMAN will not be held responsible for any consequences due to events that are not under its control, especially in the case of force majeure or related to the carrier that could delay or prevent the delivery of ordered products. Delivery time cannot in any case lead to the payment of damages and interest to the Client or to its service providers. ARCHIMAN reserves the right to split deliveries, given that the delivery fees will only be invoiced, in this case, one time. Notify our Client Services, by written and detailed means, of your possible complications within a time period of 3 days and through conserving proof of your message. In absence of the abovementioned procedures, ARCHIMAN considers that you have received the products in a satisfactory condition. ARCHIMAN endeavors to present and describe all of it products in the most precise and exact manner possible. The list of products presented on our website is not exhaustive. Photographs illustrating our products are for referential purposes and are not contractual. Our products are available according to available stock. 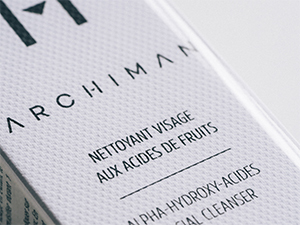 ARCHIMAN does its best in ensuring that all of its products for sale are available. However, in the event that a given product is out of stock after the final confirmation of your order, ARCHIMAN’s Client Services will contact you within a maximal time period of 72 hours to inform you of the latter or that the shipment will be delayed, and in this case, communicate the estimated time of delivery. - To receive the entire order at the same time, once the order products become available again. Where applicable, ARCHIMAN will reimburse you the associated amount within 14 days, after receipt of written notification indicating that you wish to cancel all or a portion of your order. You have the right to a 14 (fourteen) day period, starting on the day after you or a third party other than the carrier have received the order, to exercise your cancellation rights without need for reason. Pursuant to Article L.121-28 of the Consumer Code, cancellation rights cannot be exercised for supplied goods that have been unsealed by the Client after delivery and that cannot be returned for hygiene reasons and for health protection (ex. : skin care products, makeup…). All goods returned to ARCHIMAN in contradiction to Article L.121-28 of the Consumer Code will be sent to back to the Client at their expense, without the Client being capable of request any type of possible compensation. Returns and Reimbursements: All clients can request a reimbursement for a given product within the time period of 15 days starting on the date the order was placed. Returns for orders delivered to Continental France are at the expense of the Client. The product, for which the Client is requesting an exchange, must be intact, not opened and still in its original packaging. For Clients in Continental France, Corsica and Monaco: For a simple return and a rapid reimbursement, send an email to commande@archiman.fr specifying your order number and the reason of the return. Print the return label provided to you, attach it to your package and deposit your package at a post office. For clients outside of Continental France: The Client must include in the package, the order number associated to the return, the name of the product(s) associated to the return, as well as a reimbursement request. Ordered on ………../received on ………. If the product is refused by ARCHIMAN given that it does not conform to the terms of return, or the product has been opened, is non-intact, or the original packaging is absent, the return will be sent back to the Client and shipping will be paid by ARCHIMAN, without the client being capable of requesting any compensation of any nature. If the order has been accompanied by a gift – for example, a gift offered if a minimum payment amount has been attained – if you return the products and the order’s minimum amount remaining does not meet the offers conditions, the gift must then be returned in order for reimbursement to take place. In the case of cancellation, ARCHIMAN will reimburse the amount associated to the cancelled product as well as the delivery fees, at the latest14 (fourteen) days after the cancelled product has been received by ARCHIMAN. ARCHIMAN will proceed to reimbursement by using the same payment method that was used in the initial transaction, unless a different method was expressly agreed upon; In any event, the reimbursement will not engender any costs to the Client. Article L. 217-4 of the Consumer Code: The seller delivers a good that is pursuant to the contract and responds to all conformity defects during delivery. The seller also responds to all conformity defects associated to packaging, setup instructions or assembly when the latter has been taken into account by the contract or is under its responsibility. Article L. 217-5 of the Consumer Code: The good complies to the contract: 1° If it is appropriate for normally expected use of such a good: - if it corresponds to the description given by the seller and possesses the qualities that were presented to the buyer in the form of a sample or a model; - if it presents the qualities that the buyer might legitimately expect in view of public statements made by the seller, the producer or by its representative, notably through advertising or labelling; 2° Or if it presents characteristics that were defined through common agreement by the parties or is suitable for special use sought out for by the buyer, acknowledged by the seller and that the latter has accepted. Article L. 217-12 of the Consumer Code: Legal action resulting from conformity defects must be made within a two year time period after having received the good. Article 1641 of the Civil Code: The seller is responsible for the furnishing a guarantee for hidden defects of the sold item that make it unusable for its intended usage, or that drastically diminish its usability for the buyer, or for which the latter would have paid a lower price if they would have known. Article 1648 of the Civil Code: Action resulting from retributory vices must be brought by the buyer within a time period of two years after discovery. is responsible for proving the existence of defect of the good within twenty-four months after the delivery of the good. Legal conformity guarantees are applicable independently from possible commercial guaranties. The Client can decide to exercise their rights to guarantee for hidden defects of a sold item, as defined by Article 1641 of the Civil Code and within this context can decide between sale cancellation or price reduction pursuant to Article 1644 of the Civil Code. Promotions codes are applicable only to base prices without previous price deductions. Promotional codes cannot be combined, nor combined with vouchers. Promotional codes are only usable 1 time per Client account unless ARCHIMAN as communicated the contrary. These codes are not reimbursable if products are exchanged. We collect certain personal information pertaining to your online orders on the website http://www.archiman.fr exclusively for the execution of our services, such as the management and monitoring of your order, invoice management and delivery management, and if applicable to allow you to view your order history if you have created a Client account. When you place an order and create a Client account, in order for us to access to your order history, we will need to know your last name, your first name, e-mail, telephone number, address, payment information and your password. This information is conserved for a maximum of 3 years after the last invoice that you have received. It is important that you do not disclose your “Client Account” information to third parties, account usage is strictly personal. If you do not wish to create a client account, you can order as a visitor. In this case, we will need to know your last name, your first name, e-mail, telephone number, address, payment information. The information collected will allows us to procced to processing your order; after the fact, we will not conserve your personal information. Please note that in all cases, we will not conserve your banking information that exceeds the time necessary to complete the transaction. Personal information collected on http://www.archiman.fr is for the exclusive use of ARCHIMAN and will not be released to third parties. Your personal data is processed by ARCHIMAN and can be transferred and processed by third party providers that are located outside of the European Union. In this case ARCHIMAN insures that the transferring of your personal data is performed pursuant to applicable law and especially if the territory of destination was subject to an adequacy decision by the European Commission, or if the recipient has validated the contractual clauses validated by the European Commission and/or the adapted organizational and technical contractual provisions have been put in place. The only third parties that have the rights to access are our services providers: the company Bureau Beaubourg, website conception agency, the company Logistic Network our logistical platform, the company MailChimp for e-mailing routing, Google Analytics for the analysis of our statistics and lastly our hosting company Gandi. We commit to protecting your private information when you use our website and we insure the confidentiality of all personal information that you furnish. Pursuant to the General Data Protection Regulation n°2016/679 date the 27th of April 2016, you have the right to request to ARCHIMAN access, modification, portability and/or the deletion of your personal data, as well as limiting the processing of the latter and to oppose its usage without being subject to the receipt of an automatized decision. You also have the right to make a claim to CNIL https://www.cnil.fr/. The present GTC can be modified at any moment in time. The new General Terms and Conditions are only applicable to sales taking place after the completion of modifications. French law is applicable to all difficulties encountered and litigations for which the sole competent authority will be the French Courts of Law.